Las Vegas helicopter tours are the perfect way to explore the Strip, downtown and parks and other attractions located around. Despite of what you might think, helicopter rides over Las Vegas Strip are quite cheap, usually at or under $100 per person depending on current discounts, but imagine the excitement that comes with it! You can combine your tours of the Strip with Hoover Dam and Red Rock Canyon. Or even fly over to the Valley of Fire! No matter which ride you choose, they all will leave you breathless! This Las Vegas helicopter tour is quick and to the point at one of the most beautiful times of the day. Once you leave on your air-only excursion you will feel the adrenaline from lift-off to landing. You will soar over such landmarks as the Las Vegas Strip, celebrity homes, exclusive golf courses, Lake Mead and the mammoth Hoover Dam. As you fly through the sky just before the lights in Sin City open up another aspect of this wonderful journey, the orange, purple and blue sunset will be accented by the Mojave Desert landscape. Participants must have valid government identification according to FAA regulations. 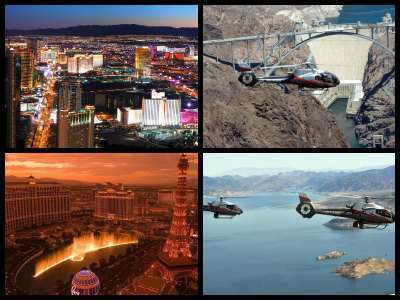 This is the most popular, and the cheapest Las Vegas helicopter tour - under $100. You can read the raving reviews of people who took this tour. 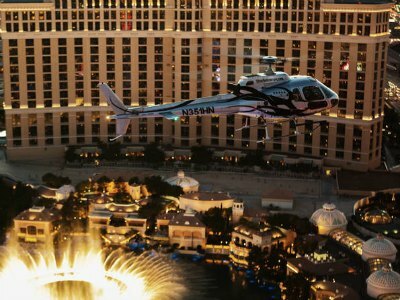 The tour departs at about 8:30 pm, and the helicopter flies all over the Strip, passing by the most beautiful hotels, including Caesar's Palace, Bellagio, The Venetian. These hotels look amazing from the ground - imagine what they look like from above! The helicopter will pass by the Bellagio Fountains as they perform their intricate dance, and by the space beam of the Luxor. 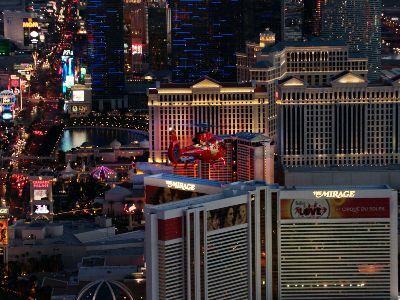 When you want to see bright lights of Sin City from a bird’s eye view then an ideal Las Vegas helicopter tour is the Las Vegas Night Strip Helicopter Flight. Your excursion starts with pick-up service from your hotel where you will be taken to board a specially designed sightseeing helicopter. You will enjoy a champagne toast just before take-off and then soar high above the neon lights of the Strip. During your 15-minute flight you can listen to interesting stories about Glitter Gulch as you peer down on the brightly lit Strip. During your flying adventure you will be able to see the Fountains at Bellagio, the Eiffel Tower, the High Roller, the Luxor Pyramid as well as numerous other fantastic hotels. Your excursion concludes with drop-off service at your hotel or you can choose one of the many add-on options that include which range from nightclubs to dining. 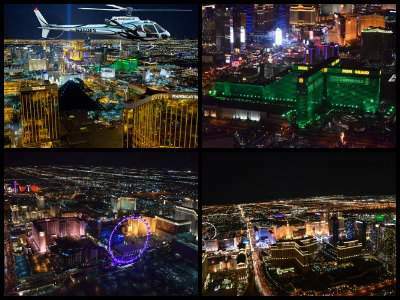 One of the more popular Las Vegas helicopter tours for all types of travelers looking to view the incredible neon lights of the Strip is to take the Deluxe Las Vegas Helicopter Flight with VIP Transportation. Your 2.5-hour flying adventure starts with complimentary pick-up service from your hotel in vehicle options that range from a Mercedes Sprinter to luxury limousine. While you are driving you will be treated to views of Sin City from the ground and before you board your customized sightseeing helicopter you will indulge in a free glass of champagne. Once in the air you will be thrilled with your 15-minute flight over such spectacular places as the Bellagio Fountains, the erupting volcano at the Mirage, the Eiffel Tower and the Luxor Pyramid as well as the amazing Stratosphere Tower. Once you have landed your flying excursion concludes with drop-off service back at your hotel. 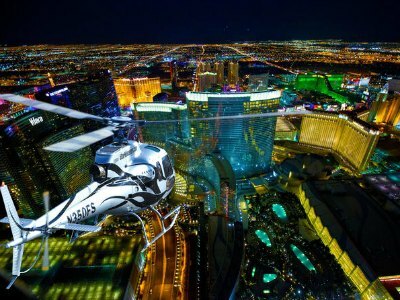 A superb way to see the neon lights of Sin City is on a Las Vegas helicopter tour and the Vegas Night Out Las Vegas Night Flight and Dinner for Two is perfect romantic option. Your 4-hour night of romance begins with complimentary limousine pick-up service. You can you sip on champagne while driving down the Strip before reaching your customized sightseeing helicopter. 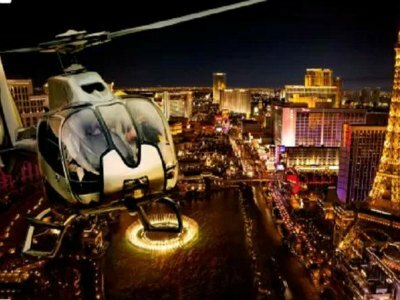 Once comfortably seating inside the helicopter you will soar into the beautiful night skies over Sin City taking in all the incredible sights from a unique vantage point. You will be amazed as you gaze downward on the Bellagio Fountains, the Luxor Pyramid and the erupting volcano at the Mirage. After landing the fun does not stop and you will drive in your private limousine to one of three restaurants for a delightful night of tasty cuisine. When you are finished devouring your meal at Nora’s Cuisine, Ferraro’s Italian Restaurant or the Alize for French dishes at the Palms your relaxing evening comes to a close when you are transported back to your selected hotel. An ideal Las Vegas helicopter tour for couples looking to have a spectacular view of Sin City and a romantic dinner is to try the Vegas Night Out VIP Helicopter Strip Flight and Eiffel Tower Dinner. This 3-hour romantic journey will begin with complimentary pick-up service from your hotel where you will be driven to a state-of-the-art sightseeing helicopter. Once on board you will indulge in a champagne toast and then soar into the skies above the Strip taking in all the interesting sights from a bird’s eye view. When you land you will be driven to the Eiffel Tower where you will be seated with a view of the Bellagio Fountains. During your three-course meal you will be delighted with the cuisine as your taste buds begin to smile and your eyes will pop out viewing the incredible panoramic views from the tower. Your romantic excursion comes to an end with drop-off service back to your hotel. 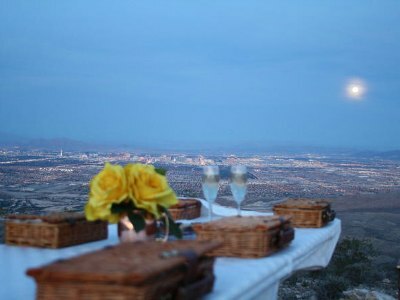 When you want to combine a view of the stunning built environment of Sin City with breathtaking scenery then an ideal Las Vegas helicopter tour for you is the Red Rock Canyon Helicopter and Twilight Picnic. Your 2.5-hour adventure starts with a luxurious ride in a limousine from your hotel to a nearby heliport where you will board a customized sightseeing helicopter. After take-off you will fly above the Las Vegas skyline taking in all the sights while listening to interesting from your pilot. As you soar above the Mojave Desert you will approach the next place to explore which is the Red Rock Canyon Conservation Area. Here you will land on a secluded plateau where you will indulge in a complimentary picnic which features champagne while you gaze at the gorgeous landscape of this unique place. When you return to Las Vegas you will fly over Mt. Charleston before you land and are transported back to your hotel where your excursion concludes. 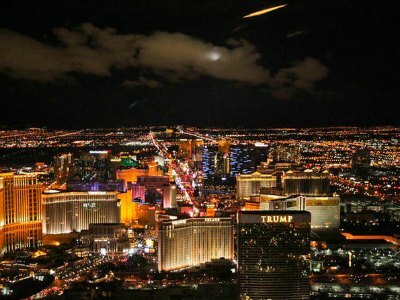 A perfect VIP way to see Sin City from a Bird’s Eye view is to try the Strip Highlights with Limousine Transfer Tour. Your 1.5-hour adventure offers numerous departure times throughout the day as well as night and begins with complimentary limousine pick-up service from your hotel where you will ride in style to the McCarran Atlantic Terminal. Here you will board a customized sightseeing helicopter and take-off into the skies above Las Vegas for your 15-minute flight. As you soar above the Strip you will fly over all the incredible sights like the New York New York, the Eiffel Tower, the Bellagio Fountains, Roman architecture of Caesars Palace and the Clock Tower in St. Mark’s Square at the Venetian. Other great sights you will view include the High Roller, the Stratosphere Tower and all the neon of historic Downtown. Your pilot will turn back to the heliport and you can see the glorious sights again on your return trip. Your Las Vegas helicopter tour concludes with limousine service back to your hotel. 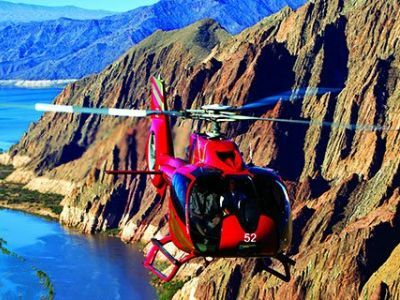 The Las Vegas helicopter tour of the Black Canyon gives you the best bird’s eye view of incredible natural scenery and one of man’s greatest engineering feats. Your adventure begins when you board a customized sightseeing helicopter at Henderson Heliport. From here your adrenaline will be lifted to new heights as you take off into the skies above the Mojave Desert. You will fly for 10-minutes over 20-miles experiencing spectacular views from 2,500-feet above the ground. Your eyes will be pleased as you pass over the Hoover Dam, the volcanic Black Canyon, the mighty Colorado River and Lake Mead-the largest manmade body of water in the Western Hemisphere. After another bird’s eye view of the canyon and the dam you head back to the heliport where your excursion concludes. 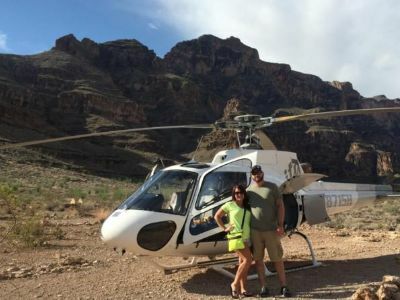 An incredible way to see the Grand Canyon that is packed with fun and adrenaline is the Grand Celebration with Las Vegas Strip Helicopter Tour. Your 4-hour journey starts with complimentary limousine pick-up service at your hotel where you will be transported to the McCarran Atlantic Terminal. Here you will board a customized EC130 sightseeing helicopter and take-off into the skies. While flying to the Grand Canyon you will pass over such sights as the Hoover Dam and Lake Mead National Recreational Area while you follow the Colorado River into Grand Canyon National Park. As you soar above the canyon you will have great views of Eagle and Guano Points on the West Rim before your pilot descends 4,000-feet to the canyon floor. Here you will land and have a picnic lunch with a champagne toast while you gaze at the fabulous landscape. Back in the air you soar over the Mojave Desert until you start to see the hustle and bustle of the Strip. As you fly over Sin City you will be amazed at the bird’s eye you have of such monuments like the Eiffel Tower, the Bellagio Fountains and the Luxor pyramids as well as the bright neon signs. Your Las Vegas helicopter tour concludes with limousine service back to your hotel. When you want a full day of adventure that is packed with adrenaline then you need to try the Shooting and Doors-off Helicopter Tour from Las Vegas with Optional ATV Tour. Your 7-hour adventure begins with free pick-up service from your hotel where you will be transported to the Boulder City Heliport. As you drive you will make a short stop at the Hoover Dam where you can take photographs of the Colorado River, Hoover Dam and Lake Mead. Once at the heliport you will board a state-of-the-art sightseeing helicopter and take-off into the sky. You will soar to the Grand Canyon where you will have an incredible bird’s eye view of one of the Seven Natural Wonders of the World. 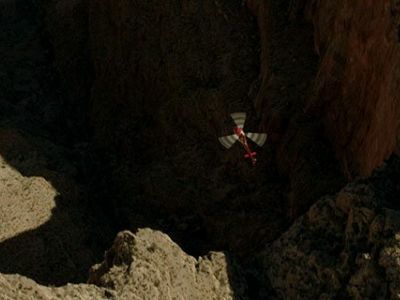 Your pilot will descend 4,000-feet to the canyon floor where you will indulge in a picnic and champagne toast. Back on the ground you next adventure begins. You have a choice of five different shooting packages that include numerous .50 caliber high powered rifles such as the Desert Eagle, Browning BMG and a Barrett Sniper Rifle. After finishing shooting off your rounds you will be treated to an all-American lunch. There is a great add-on option you take after shooting too. The option is a 3-hour ATV ride that takes you along the Colorado River for 22-miles. Your Las Vegas helicopter tour concludes with drop-off service back at your Las Vegas hotel.